Trying to put a whole look together and make it work from the things I am committed to blog is sometimes a challenge. I want to have some coherency, a look someone could imagine wearing. I have been working on another project lately so I feel a little fragmented but I hope this one comes together for you. It helps that Harry Hyx has made this elegant top and skirt in limited colors—teal, tan, beige, and white—so I have one main color with neutrals. The beautiful drape Harry manages with mesh and great texturing is amazing. I opted for the teal top to match this new jewelry from Abraxxa Anatine that includes in the set her unique Harmony ball. My friend has one of these in real life. It jingles very softly and sonorously as you move and Abraxxa has included options to allow that in SL. She also includes texture change options on the jewelry so you get an assortment of looks available, though I loved the Chrysocolla stone that was on the pendant already. The set comes with the shorter pendant, two varieties of bracelets, rings, and earrings. 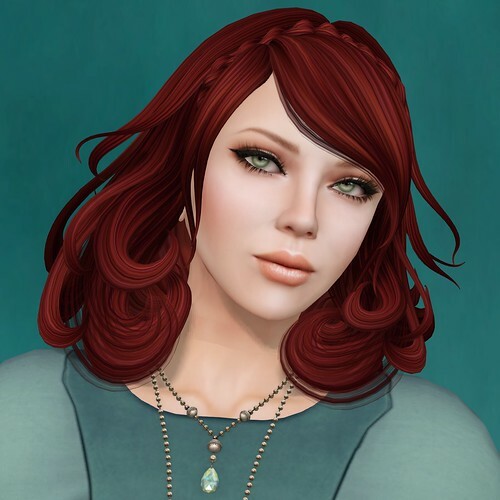 Sawsan Secretspy has come out with a new set of skins for the Fashion Fair. As always I look elegant and sublime in her skins with their subtle blush, soft lips and beautifully-lined eyes. MissAllSunday Lemon made this darling hair with a braid hairband for Uber. She has taken mesh and run with it, having converted her once-fantasy hair business into an almost-industry with beautiful mesh pieces combined with great textures. I just please wish she would consider using a texture-change HUD so my inventory can be brought into better harmony.